There is nothing I love more than combining some of my favorite things in life: hazelnuts and chocolate (Nutella! ), Yankees stadium and foot-long hot dogs, impromptu dance parties and karaoke, and of course… food and fashion! It is Fashion Week in Milan from September 22nd -28th this year, and the stars have finally aligned—I am in Italy, I am traveling and I am on a mission. 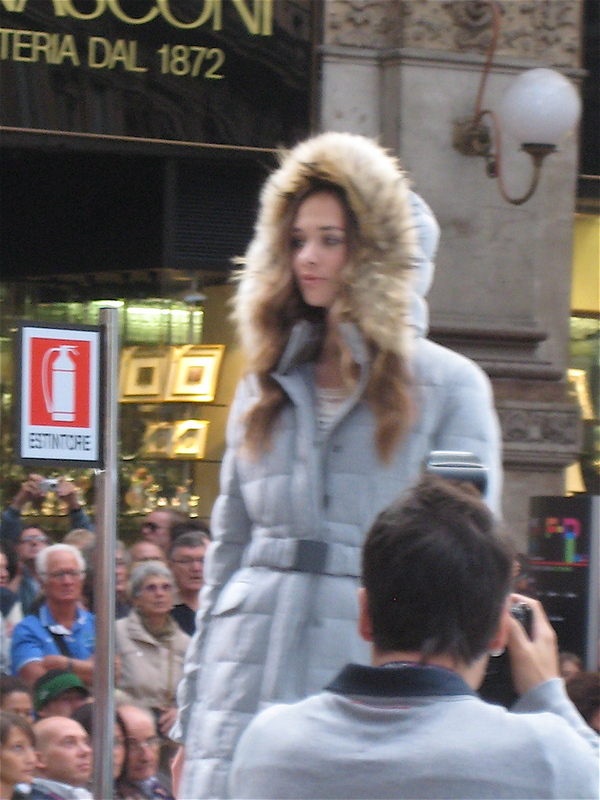 I want to see Milan for the first time, have some great Milanese (north Italian) fare and catch some fashion shows. We arrive at the Milan train station and are welcomed by a grandiose train station that leads directly to the Centrale metro. To get to the metro, we pass by fancy shopping areas constructed with light marble, small food shops and a distractingly gigantic Cristiano Ronaldo Armani ad. 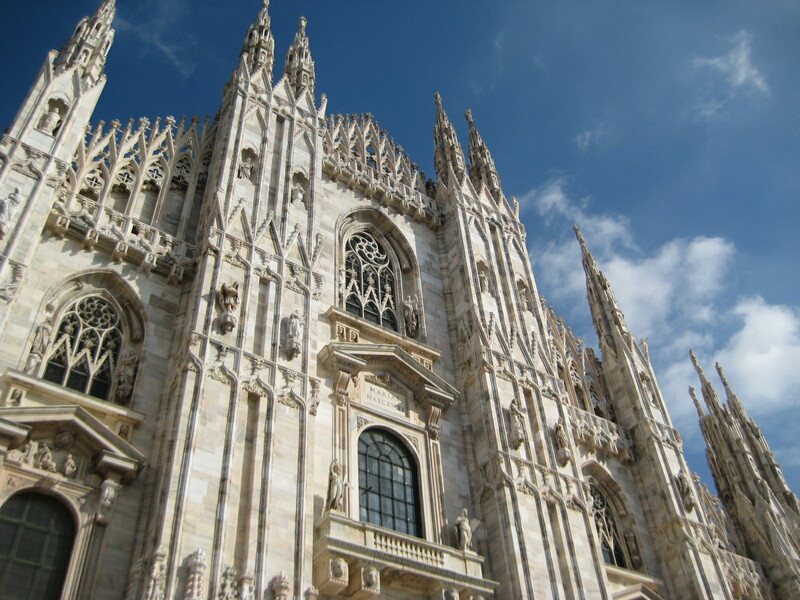 A few metro stops later, we are right in the center of the city, where Milan’s Gothic-style cathedral (Duomo) stands. 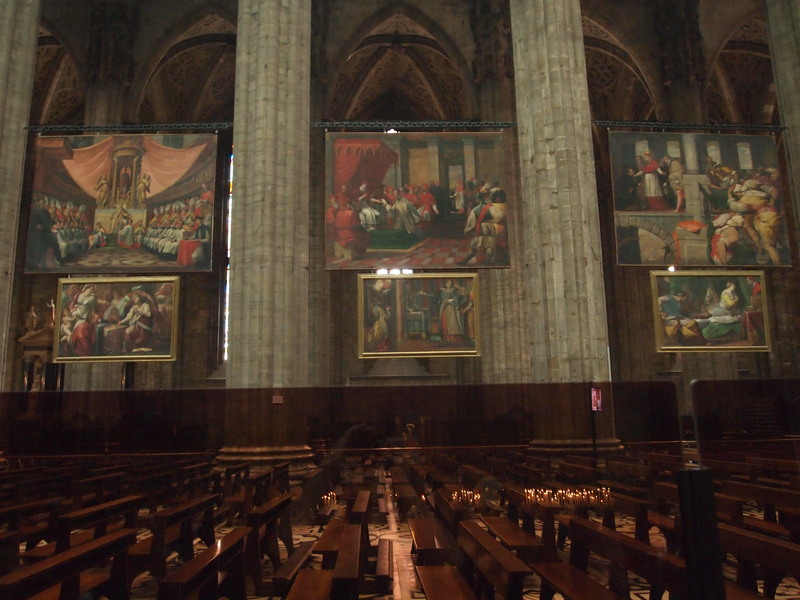 The interior of the cathedral is beautiful, and can make any non-believer feel just a bit more spiritual. For an additional 5 euros, we climb to the top of the Duomo, which is actually much quicker and less strenuous of an experience than climbing to the top of the Duomo in Florence. Right next to the Duomo is the Galleria Vittorio Emanuele– a shopping area enclosed with glass ceilings, similar to the one in Naples, but with luxury stores such as Louis Vuitton, Gucci, and Prada. The crowd is overwhelming and persistent, as people elbow their way through to the center, where we see a large stage with stairs and mannequins set up. There are three ready to wear (literally…ready to wear) Italian fashion shows lined up for the evening, and we get to catch two of them: Mabrun and Camomilla Milano. (Faux) Fur is in! And love the full sheer skirt under the heavy jacket. 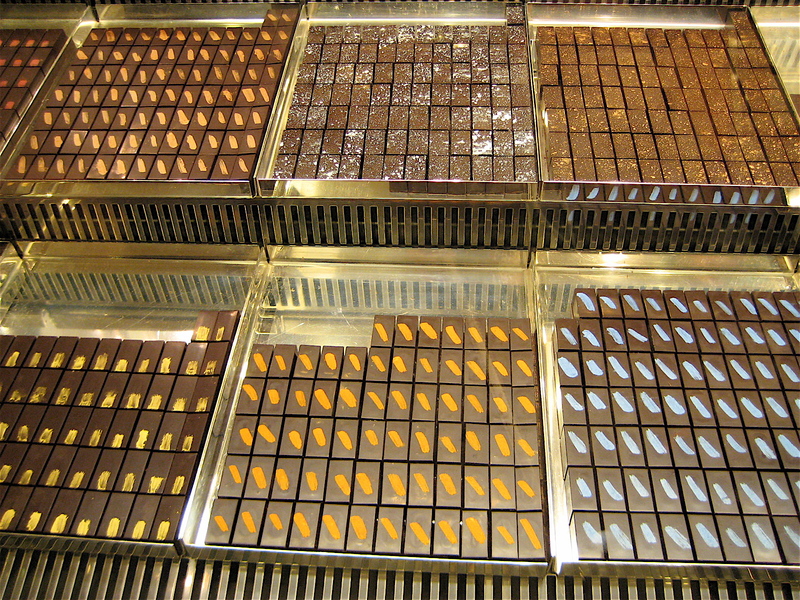 Looks like colors are in for spring at Camomilla Milano! 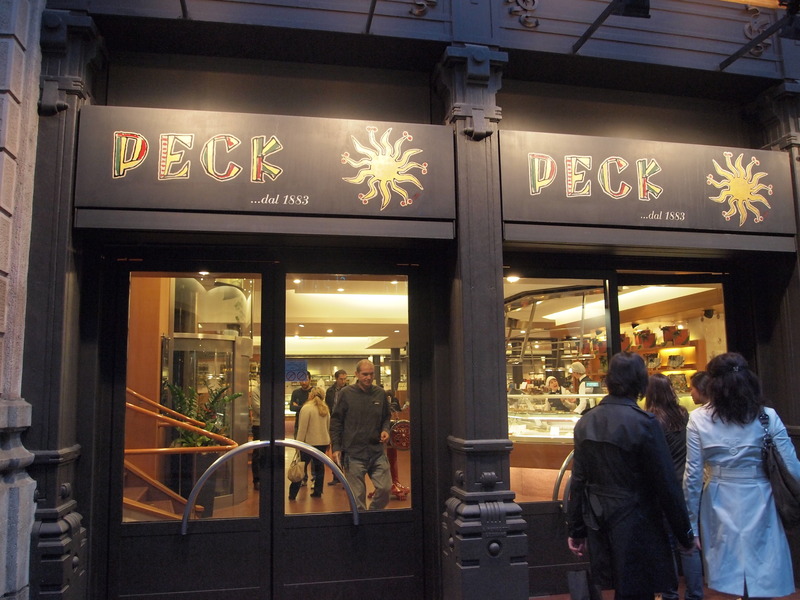 Off the Piazza Duomo on Via Spadari is the most gourmet of gourmet grocery stores, Peck. 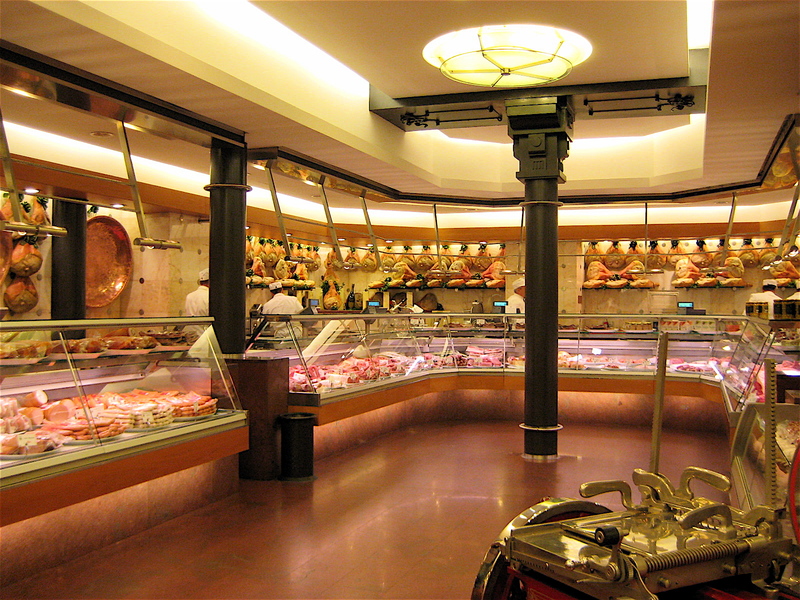 It is three floors of shiny deli machinery, Italian cured meats, imported produce, delicate chocolates, and freshly made everything. The first floor is a brightly-lit, open space with long counters for each section. The second floor (no photos allowed, apparently) is stocked with large selections of coffee beans, tea, biscotti, and has a small café area with a few tables for patrons. The basement features a vast wine collection with bottles from 14 euros (the Peck brand) to thousands of euros. There are some super skinny and stylish models milling about in the store, probably taking a break from the fashion shows to take a look at some amazing food. 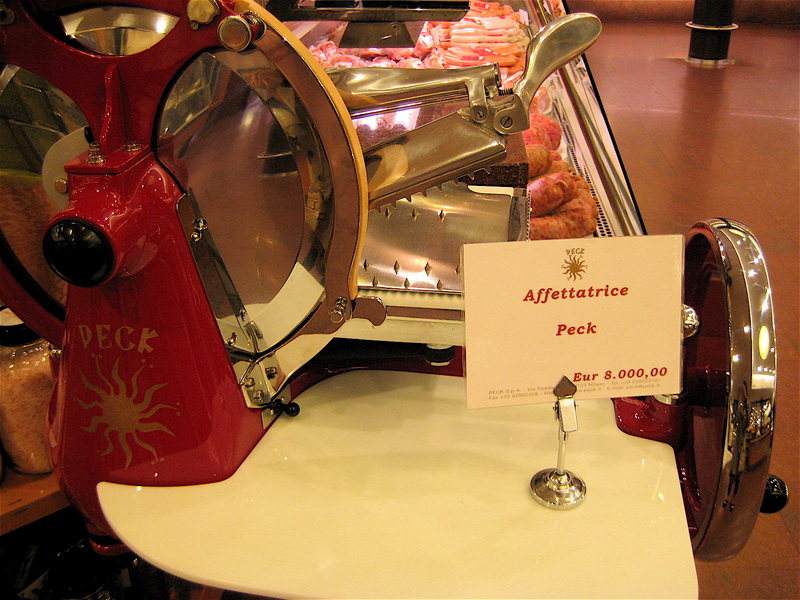 Everything looks fantastic and tempting but there is nothing I really want to get at the time, (except for the 8,000 euro antique deli meat slicer below) since I am busy thinking about the great dinner we are about to have. 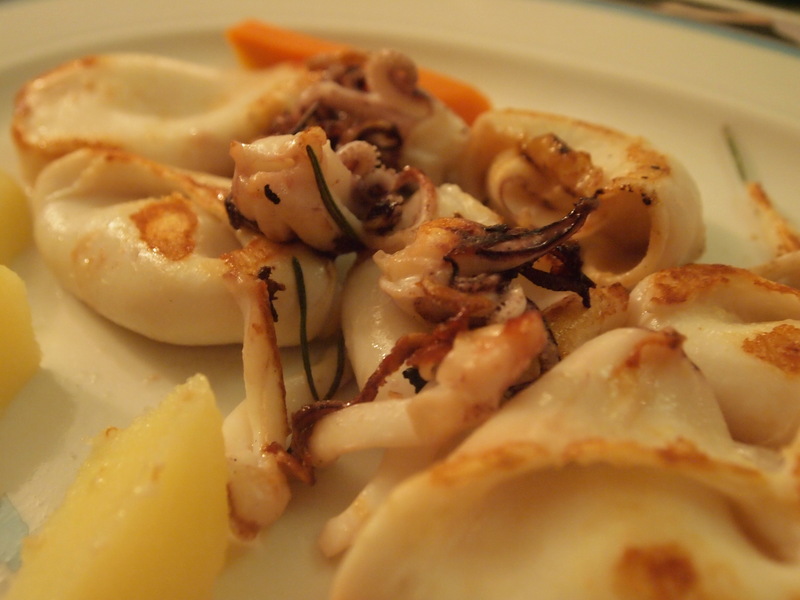 I had read some great reviews of the Trattoria Milanese (Santa Marta, 11) and suggest that we go there. It takes a little bit of walking—and one quick stop for directions—before we get there. But alas, it is CLOSED! On a Saturday night! Oh, the heartbreak! We are so hungry and don’t have a Plan B, so we decide to wander around the area and leave it up to fate to find us a good place to eat. After about 15 minutes of walking, we see a little courtyard and a sign for Ristorante Al Mercante. I have a good feeling about this one, so we run across the street and step into our chance restaurant pick. 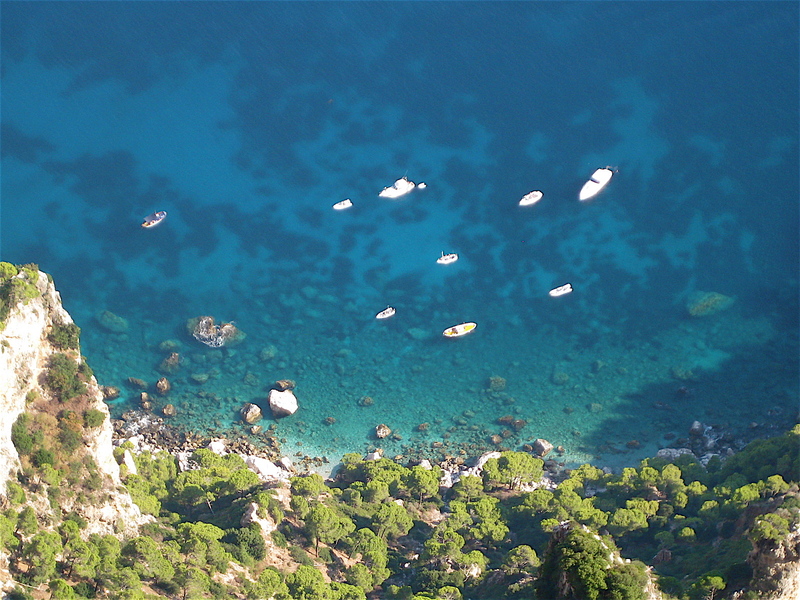 It is a very warm and inviting place, full of what appear to be local Italians. The host immediately asks if we have reservations… uh oh… can it be that this place wasn’t meant to be after all? The host thinks for a minute and then signals to a waiter, who then leads us upstairs to another dining room, where he takes the “reserved” card off of a table and seats us. Success! Milan, and the Lombardy region of Italy as a whole, is known for its rich dairy products such as milk, cream, butter and cheese. Milanese cuisine incorporates these ingredients into its signature dishes, particularly pasta with cream sauces and risotto, which is fantastic for absorbing all of the rich flavors it is cooked in. A family gathering of about 20 people livens the atmosphere, and makes us even hungrier with all of the great Italian food spread out buffet-style, including a giant wheel of Parmesan cheese that they directly cut out of. 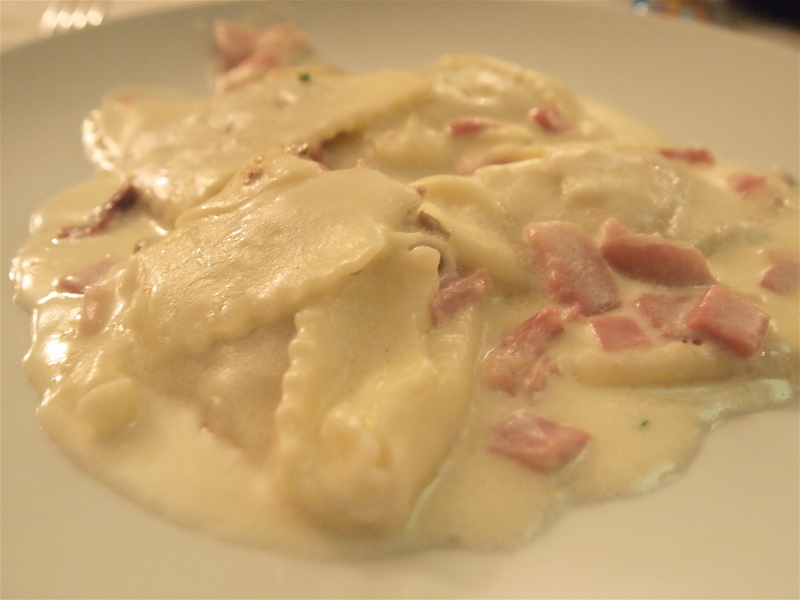 The ravioli with cream sauce and prosciutto is thick and rich. The ravioli is soft and chewy, with a thin meat filling. The sauce is incredible! The entire platter is so fresh and minimally processed that the coloring is a light, creamy white. Great pick by Pietro! My pappardelle with zucchini flowers and small pieces of fish (below) is very subtle and light. 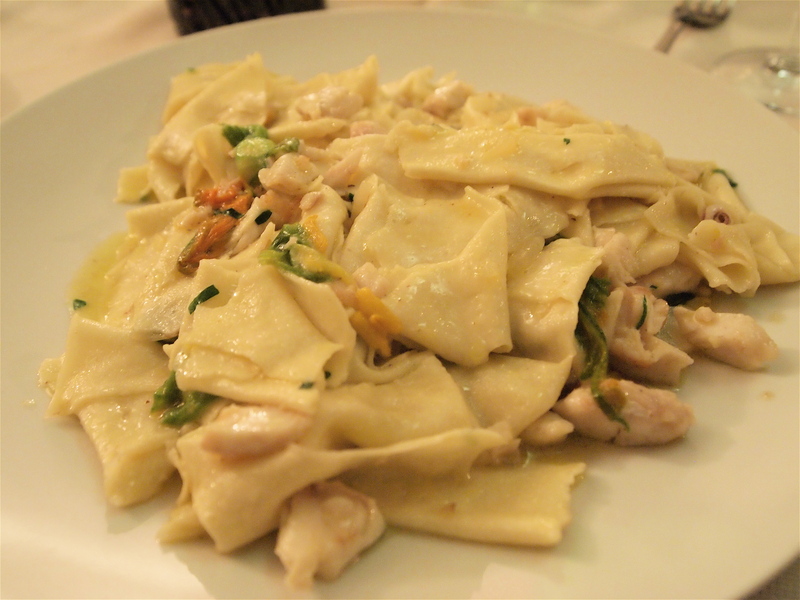 Pappardelle is a type of very thin and large, broad pasta that is soft and almost resembles wonton skins when it’s cooked. Zucchini flowers are delicious. 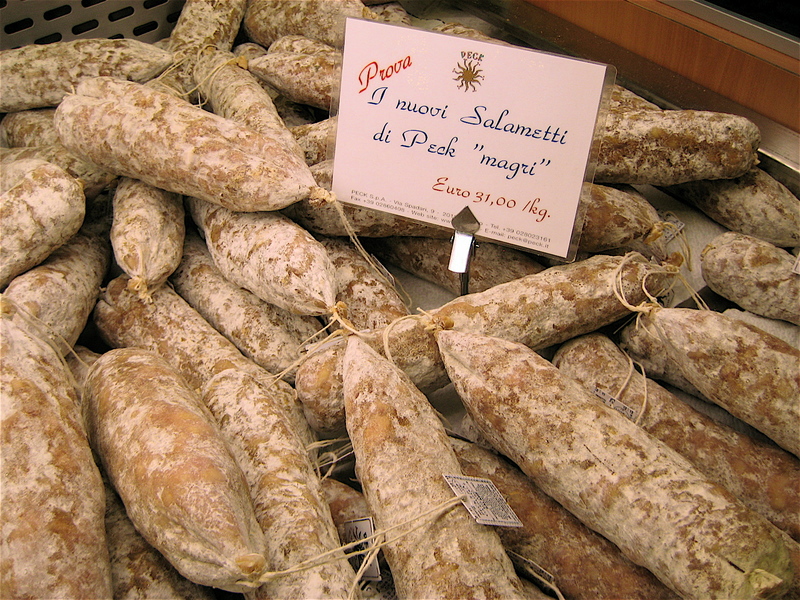 When you see them at the Italian markets, they vary in size and have green stems with bright orange blooms. 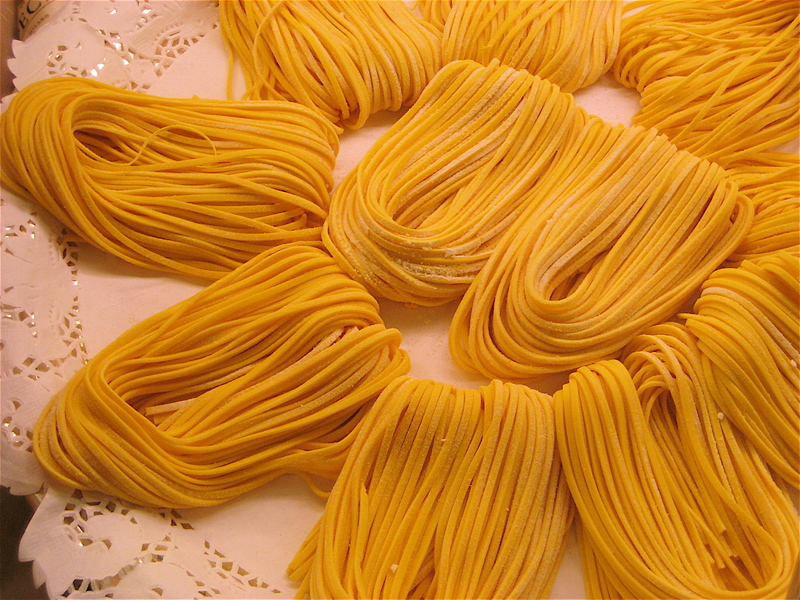 The pasta is cooked with the two main ingredients- tossed in some olive oil and butter. Because the pasta is fresh and so delicately thin, it all kind of sticks together and you have to cut it with a knife. 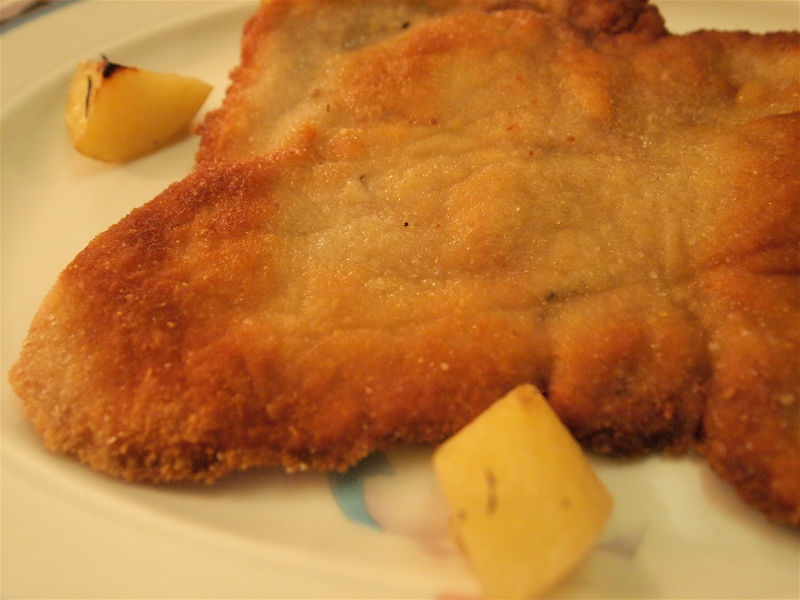 Emma orders the classic cotoletta alla Milanese, which is one of Milan’s specialties. It is a very thin veal cutlet of buttery and fried deliciousness, along with a few small yellow potato wedges. I don’t normally eat veal, ever since I learned about where it came from back in middle school, but I feel like I have to make an exception (since I thought that maybe veal was happier here in Italy) and have a tiny sample. What can I say, it is battered and cooked perfectly. For our secondi course, Pietro orders the grilled calamari. Unlike the calamari we’ve ordered at other various restaurants, this calamari is chopped into larger pieces and is soft, rather than tough to chew. It is seasoned and grilled with fresh rosemary, which makes it super flavorful and fragrant. 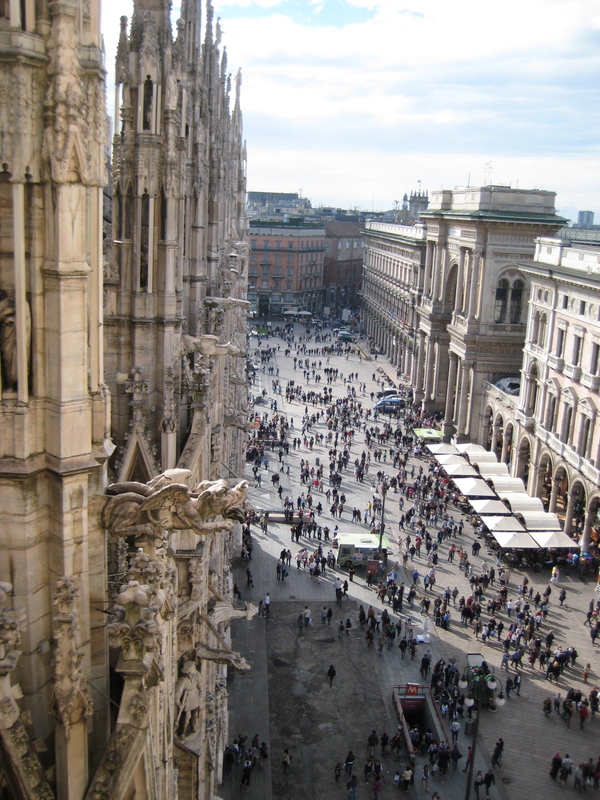 Milan is a great cosmopolitan city that is modern, efficient, hectic, and full of stylish people that walk fast– kind of like the New York City of Italy. Brings me a little closer to home. On the slow train ride back, I leave Milan feeling like I just had great mix of it all- a delicious, incredibly satisfying meal; next season’s fashion trends; great company…and to top it all off, food fate was on my side! Mission accomplished!